Throughout 2015, echoes of the anniversary year were given by different media, in the press and on the internet. On this page you will find a non-exhaustive selection of articles and links of interest. Media wishing to cover the international meetings in Taizé, Bucarest, Cotonou or Riga: please contact media taize.fr. The “newsletter” of the Global Christian Forum, a place of dialogue between historical churches and various evangelical currents and Pentecostal churches, reported on the week of 9-16 August. The World Council of Churches published an article about the week of 9-16 August as well as a report on the international theological colloquium. Both articles can also be read in German. More recently, Dave Bookless, from the international association “A Rocha” published an reflection upon three weeks of his summer, the last of which he spent in Taizé in mid-August. The photographer Michael Debets compiled a report in photos about the week of 9-16 August. A gallery about the evening prayer on 15 August is still online on the site of Pacific Press with another about the day of 16 August by the Demotix agency. One of his photos was published on the online site of “The Guardian”. On 2 August 2015, “France 2” broadcast the Eucharist live from Taizé as its weekly worship programme « Le Jour du Seigneur ». It is still available online. The televised Eucharist was also covered in a photo-report on the site of the “Journal de Saône-et-Loire”. A number of national French media outlets covered the weekend of 15-16 August in Taizé. The 1pm news journal on TF1 spoke of the international dialogue encouraged by the meetings. The regional station France 3 Bourgogne devoted two reports to Taizé during the weekend of August 15-16. On Friday 14 August, Brother Alois was the guest on [Europe 1-http://www.europe1.fr/emissions/l-interview-verite/frere-alois-les-religions-sont-une-force-de-paix-2502453], with Patrick Roger. French national radio France Inter, France Info and RTL covered the international gathering by sending a journalist for their weekend news reports. Radio Vatican interviewed two Catholic leaders, Cardinal Manuel Clemente, patriarch of Lisbon and Mgr. Benoît Rivière, Bishop of Autun. The blog jeunes-cathos.fr also covered the international gathering and the project “Humans of Taizé,” followed by a photo exhibition at Taizé. In the “La Croix” newspaper dated 9 August, four pages were dedicated to the international youth meetings. A set of photos is still on line. At the end of August, the “KTO” TV channel broadcast, as part of the series “Hors les murs” a major documentary lasting 52 minutes prepared by a team that had followed the August gatherings. In Switzerland, the French-speaking radio “RTS” broadcast live an “ecumenical morning programme” on Pentecost Sunday direct from Taizé as well as consecrating a series of broadcasts to 2015 at Taizé. The Protestant and Catholic press agencies of Suisse Romande offered a series of articles about Taizé, fruit of their cooperation. Earlier in the year, the album produced by Universal Music was evoked in several places, including the review “Études”, in July 2015 and the radio channel “Paris Notre Dame”. In November, the families from Iraq and young refugees from Sudan now living in Taizé were covered by a number of regional media, including the evening news on “France 3 Bourgogne”. In May, the centenary of Brother Roger’s birth was marked by several publications in German-speaking media, for example a film on Austrian television and also this portrait of Brother Roger, a “fighter for reconciliation”. During the Kirchentag in June 2015, Brother Alois gave a radio interview for Deutschlandradio Kultur. At the same time, the Protestant press agency published a short article. The international gathering 9-16 August was also covered by several German-speaking Protestant websites as well as by the German Catholic press agency, which published a series of articles such as this article which is still online. In addition there is a long article about the experience of Church that the young people have at Taizé. Two young journalists from BEAM spent a week in Taizé for the paper and a report on eo.nl. The president of the Reformed Church of the Netherlands, PKN, published as well an editorial about his visit to Taizé in mid-August. The weekly “Avvenire” marked the tenth anniversary of Brother Roger’s death. A journalist from the magazines “Credere” and “Jesus” came to Taizé in July, with a photographer. One of his articles, about the volunteers, is online. The Protestant weekly “Riforma” also consecrated a good article to the 75 years of Taizé. Then, after the Paris attacks, Brother Alois was interviewed by the radio InBlu. Early in August, the newspaper “Tribuna de Albacete” spoke about the anniversaries celebrated by Taizé in 2015. 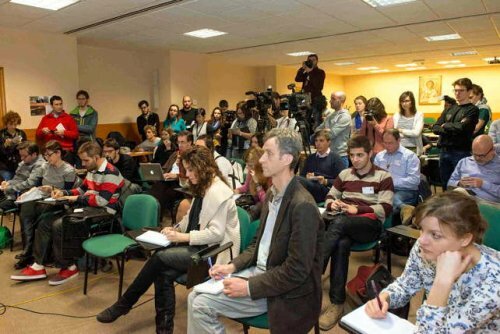 The preparation of the European meeting in Valencia was widely covered by the magazine “Paraula” and other local media, such as “Las Provincias”. Likewise, the media of the archdiocese of Valencia covered the meeting widely with a special issue and several articles in the magazine Paraula, a series of video clips and many photos. On television there was a report on the theological colloquium and an interview with a brother. The newspaper of the diocese of Lisbon gave echoes of the participation of young people from the diocese, accompanied by their Cardinal, in the Gathering for a new solidarity while a report was also broadcast on television. Radio Renascença broadcast interviews after the Prague meeting and also regularly gave news of Taizé and the Valencia meeting. Several newspaper and reviews mentioned the celebration of the anniversaries at Taizé, such as Sol, Observardor and Fatima Missionaria. The journalist António Marujo wrote a piece for the agency “Ecclesia” about the international week of 9-16 August and he also published in his blog a series of articles about the gathering and the theological colloquium of last September. A journalist from Radio Polskie, Przemysław Goławski, gave a radio report about the gathering for a new solidarity. He also published an article and a photo gallery. More recently, a long conversation with Brother Alois has been published by the site “Przewodnik Katolicki”. The presence of young refugees from Sudan was the topic of a talk with a brother for the site deon.pl. The photographer Wiesia Klemens published three photo galleries about recent visits to Taizé and Valencia of which this is the most recent. The Taizé meeting in Valencia was covered in this article online. A few months after the European meeting in Prague, written about in March on the site of the Evangelical Church of Czech Brethren, a long conversation with Brother Alois was published in several Czech medias, including the site “Christnet” and the site “Katolický týdeník”. Television SAT-7 reported on Taizé, online on Youtube. To follow news from Taizé on social networks, see Facebook and Twitter. Please write to us at this addressmedia taize.fr to make us aware of other interesting articles.